The ARPANET didn’t make its first host-to-host connection until 1969. But long before anyone was online, communications companies were trying to figure out how to make interactive home shopping a reality. 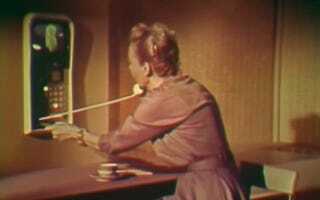 This short 1961 film from Bell Systems (now AT&T) showcases the futuristic tech that they were imagining—including a way to shop for clothes by videophone. One of the most fun things about studying past visions of the future is coming across strange uses for technology that are commonplace today. This film showed primitive forms of speed dialing, pagers, and, yes, even online shopping. But as you’d expect, it doesn’t look like the kind of online shopping we have here in 2015. In fact, it looks pretty cumbersome. Skip ahead to 10:40 if you only want to see the videophone shopping part. But the entire video is worth a look. Much like other predictions for remote shopping from the 1980s or even the 1930s, it seems relatively inefficient. Which makes sense, given the point-to-point visions that companies like Bell Systems had for communication. We got both videophones and online shopping in our 21st century future, but neither looked the way we imagined in 1961.